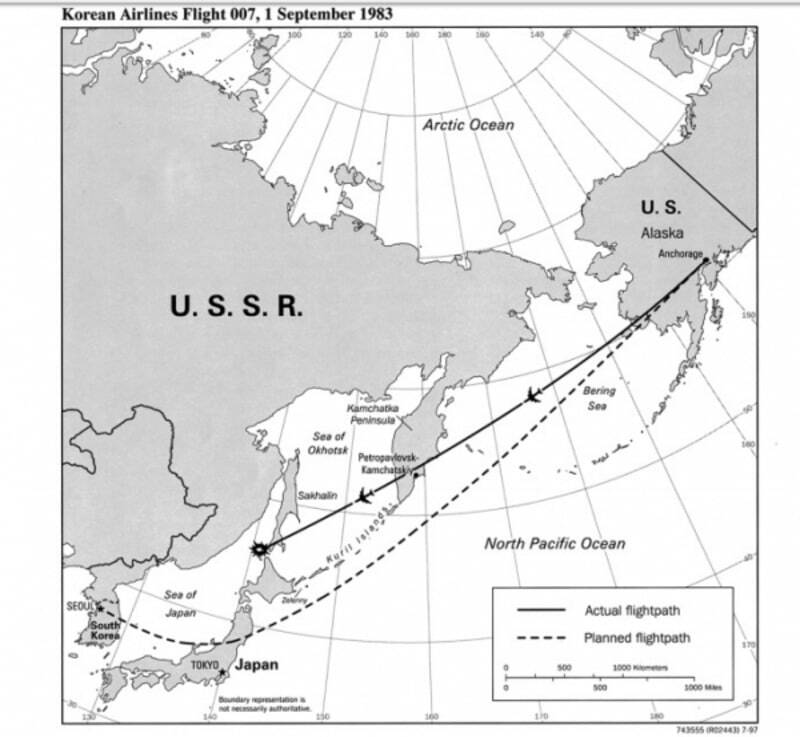 On September 6, 1983 USSR confesses, only after different days, to have fallen the Korean Airlines 007 flight last September 1st. The B-747/200 airplane, from New York City to Seoul, via Anchorage, was taken off on August 31 at 4:05 (GMT) from "John F. Kennedy" international airport in NY and had 240 passengers and 29 crewmembers on board. After a stopover in Anchorage at 11:30 GMT for refuelling, took off again at 13:00 GMT (3:00 local hour) on September 1st. The crew was composed of captain Chun Byung In, ex-fighter pilot of the Korean Air Force with over 10,000 flight hours (6600 of them on B-747) and he was chosen as personal pilot of the South-Korean President. The copilot, Song Dung Hui, was also him a former military pilot of great experience, with 9000 flight hours. Also Kim Eui Dong, flight engineer had a considerable experience, with 4000 flight hours, 2600 of them on B-747 aircraft. However the plane, perhaps for an error due to a wrong setting out of the INS (Inertial Navigation System) took a mistaken route, travelling towards one more than West of planned so finishing to fly over the Soviet air space. Two Soviet SU-15M and two MiG-23 aircraft took off immediately. At 6:26pm (GMT), according to reported later by one of the four pilots, one of the Su-15TM, without follow the interception international procedure, shot down the airplane, that crashed at 55 kms of the Moneron isle, causing the death of all passengers and crewmembers. In 1983 the easing of tensions period was completing began some year before between Soviet and Americans. In fact the starting of the Presidency by Reagan had brought out old disagreeements and arms race. In this diffidence situation, the Korean plane was probably confused by the Soviet as an American spy aircraft (the flights along the side of the Soviet borders by American patrolling planes were recurring) and for this reason it was shot down. The following on September 9 the Soviet, committed since 1979 in the Russian-Afghan wearing war, declared in a two hour press conference in Moscow, held by Chief of Staff (Marshal Nikolaj Ogarkov), that the inquiry commission had demonstrated in evidence manner that the intrusion was given approved in order to spy the Soviet. Reagan, as answer, published in tv extracts of Soviet communications intercepted by secret services that demonstrated as the Soviet were realized that the airplane was civilian and not military. In addition the US ambassador at UN, Jeane Kirkpatrick showed further recording intercepted that confirmed the Reagan's message. However, despite the constitution in 2001 of a victims' committee, the real causes and exact dynamics of the shot down remain unknown still now.